THE first intake ever of first years into an Irish language secondary school in Fingal is complete and the initial 26 students are settling down to their work at Coláiste Ghlór na Mara in Balbriggan. After a six-year battle to open a Gaelcholáiste in the town for the first time, the school finally opened its doors in temporary accommodation at Ardgillan Community College last week. Now that the dust has settled on that historic opening, students are getting down to work and enjoying their new surroundings, and no doubt proud of the fact that they belong to a small club of less than 30 students who will always be able to say they were the first to be educated through Irish at secondary level in Fingal. At the helm of the new school is Aoife Elster, who spoke to the Fingal Independent as the new school opened its doors. The Gaelcholáiste will consist of six classrooms, a science laboratory, a learning support unit, art room and a staff room as well as a general purpose area. Aoife is joined by six other newly appointed teachers, who together will offer pupils an extensive curriculum and choice of subjects – all as Gaeilge. The school principal said that it was also ‘exciting, on a personal level’ to be involved in the opening of the new school – the second time she has been involved in such a project, as a founder member of a similar school in Kildare. In 2016, the Gaelcholáiste will move to a 1,000 pupil new build, which will be located adjacent to the new ring road, in order to cater for the 880 pupils already enrolled. Using the powerful unifying force that can be sport, a school in Balbriggan has worked with schools in several other countries around Europe to invent a new ball game and the culmination of this two-year project has ended with a tournament in the new sport in Galway. Over the last two years, Gaeilscoil Bhaile Brigín has been involved along with a school in Loughrea as the Irish representatives on a Europe-wide exchange scheme that has come up with a new sport called Euroball. The Balbriggan school has been involved in all kinds of educational, sporting and cultural exchanges over the last two years with schools in Hungary, Bulgaria, Turkey, Spain and Croatia and according to school principal, Clodagh Ní Mhaoilchiaráin, the whole experience has been invaluable for both the students and the teaching staff at the school. Out of all of this co-operation has come the sport of Euroball, a ball sport that combines elements of all kinds of other ball sports like soccer, volleyball, Gaelic Football and even Aussie Rules. The sport is all-inclusive and provides for not only cross-cultural participation but also allows boys and girls to compete on a level playing field and also able-bodied competitors alongside disabled team-mates. As the school principal spoke to the Fingal Independent last week, the Balbriggan school had hosted their foreign visitors before they all set off for Galway to compete against each other in the final climactic tournament of Euroball. It is a two-year Comenius project, funded by Leargas and it has involved the entire school in Balbriggan in one way or another and contributed to a huge amount of awareness and new understanding of their European neighbours. Congratulations goes to everyone at the school involved in the project for a very successful and educational couple of years and the new sport it has given to the world. AN OFFICIAL application for the patronage of a gaelcholaiste in Balbriggan, which is due to open in September 2014, is currently being prepared by An Foras Patrunachta and local parents who have run a four-year campaignto have an secondlevel irish school in the town. The Department of Education and Skills (Minister Ruairi Quinn, pictured below) has already confirmed that the new secondary will be a gaelcholáiste but the patron has yet to be decided. The long-serving founding committee for Coláiste Ghlór na Mara, who have invested considerable time and energy in the project, believe it was their campaign, along with all the submission made to the department in September 2010, that paved the ground for the new gaelcholaistle. 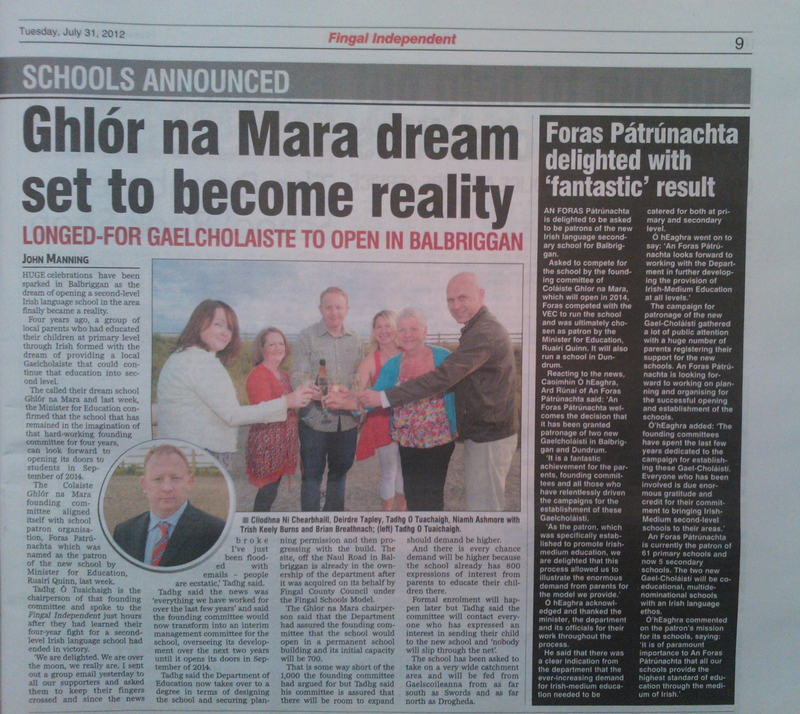 Tadhg Ó Tuachaigh, the chairman of the founding committee for Coláiste Ghlór na Mara, said: “The fact that the Department of Education has decided that the only school to be opened in Balbriggan at second level is to be a Gaelcholáiste catering for up to 1,000 pupils is everything that we could have hoped for. ‘ The demand, desire and absolute need for a Gaelcholáiste was clearly evident through the registration of 750 pupils for a school that doesn’t even exist yet. The last thing that is left to be decided is patronage and we really hope that the Department will see our efforts, along with the commitment of An Foras Pátrúnachta to our vision, as the ideal solution.’ An Foras Pátrúnachta is currently working on an official application for the patronage of Coláiste Ghlór na Mara in Balbriggan. A recent public meeting held in Balbriggan, funded by Aitheantas, gathered significant support from interested parents and community members. The decision regarding patronage will be made known in late spring 2012. To register your interest in the new Gaelcholáiste under the patronage of An Foras Pátrúnachta, please visit either www.colaisteghlornamara.com or www.foras.ie. If you would like to help with this campaign, we would be delighted to hear from you. Please email Caitríona Bairéad at caitriona@foras.ie or call 01-6284110. An Foras Pátrúnachta is the national patron for both primary and second level schools, seeking to develop, strengthen and promote education through the medium of Irish throughout the country. SCENES that attracted worldwide attention in 2007 when Balbriggan was forced to open an ’emergency school’ could return unless the Department of Education stops dragging its heels over the opening of a new secondary school, it has been warned. That is the view of the people behind a proposed new Balbriggan secondary school project that stands willing and able to solve the town’s school capacity problems at a stroke this September if the Department of Education will just give it the green light. With a nod and minimal funding from the Department of Education, a new ‘Gaelcholáiste’ which will deliver secondary school education through the Irish language for the first time in Balbriggan, is ready to go. A site which is already owned by the Department of Education is available in the town but the delay in approving the project has already cost school authorities the chance to secure discount prefabricated classrooms for the site as time ticks on towards the start of the new academic year. Gaelcholáiste Ghlor na Mara has signed up over 500 students who are interested in attending the school if it manages to get its doors open in time for September and with most local schools, particularly for boys, bursting at the seams, the arrival of the school cannot come fast enough. But despite public meetings and political support from across the parties locally, the school is still waiting on Department of Education approval. It is a source of frustration for school chairman, Tadgh O Tuachaigh, who said: ‘A shortage of second level places for male applicants to secondary schools in Balbriggan is becoming a more than likely reality for this coming September and is set to develop into a bigger crisis in 2012 for both male and female applicants. Mr O’Tuachaigh said the school stands ready to ‘resolve a major headache for the department in regards secondary school places in Fingal region’. ‘With a bit of urgency we can resolve this problem quite easily and cater for the 507 pupils who are anxiously awaiting the department’s decision,’ he added. The school is waiting for a response from the department and on a recent visit to Drogheda, the Minister for Education, Ruairi Quinn would not take questions on the issue so for now at least, those 507 potential students must sit and wait.